Star Wars Embroidery Design "May the Force Be With You"
Embroider a Quote From a Galaxy Far, Far Away! Give someone an embroidered message of good luck the sci-fi way! This free pattern is perfect if you're a fan of Star Wars or you know someone who is. May the Force Be With You is a classic quote and one that's great to stitch. 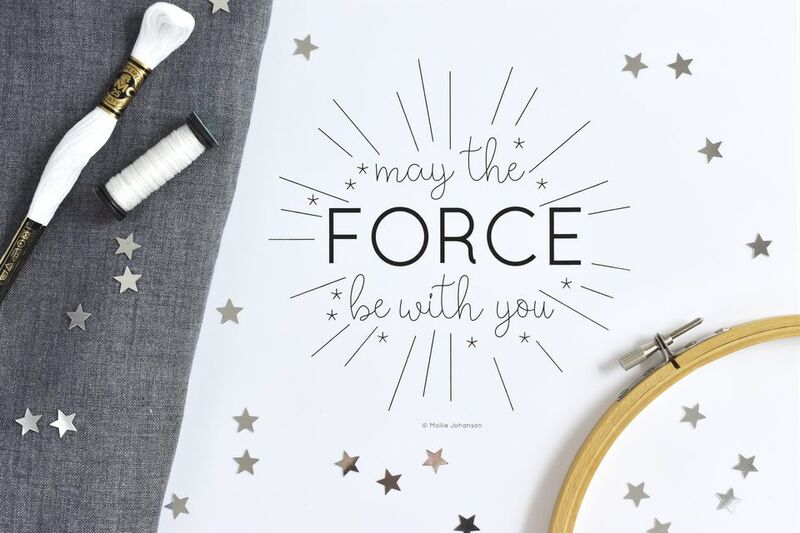 Embroider the phrase as hoop art, stitch it on a t-shirt, or make a pillow to show off your Star Wars love. You could even combine this design with other Star Wars embroidery patterns! The pattern itself is fairly simple and easy enough for beginners looking to practice a few new stitches. And if you're an experienced embroiderer you can stitch this at lightspeed! Download the May the Force Be With Your JPG file. Scale the design to a size you like and print it out. If you print the image horizontally so it fills the page, the pattern nicely fills an 8-inch embroidery hoop. Use your favorite transfer method to mark the pattern onto fabric. This design would be perfect on dark fabric so it looks like you're stitching in the stars and traveling at lightspeed. To mark a pattern on dark fabric, water-soluble stabilizer, light-colored transfer paper, or tracing paper work best. Place the fabric with the marked pattern securely in an embroidery hoop. Grab your basic embroidery supplies and threads and start stitching, following the color and stitch guide below. When you are finished stitching, remove any pattern markings or transfer material. Frame the embroidery or finalize your project however you like. In Star Wars films, they usually present the lettering in yellow over a dark, starry background. If you're using dark fabric, you can use yellow for the text in this pattern, an aqua-blue that's reminiscent of Luke's lightsaber, or work the entire design in white. Or, choose colors you like! For the stars, use white embroidery floss or a metallic thread. You can also use a light aqua for the streaks of lightspeed stars. Follow the stitch guide above for help in choosing the best stitches for this design or use the stitches you like best. Work the cursive words with two strands and reverse chain stitch. Back stitch would also work well here. Use a detached single chain stitch for the dot on the "i". Stitch the word "force" with 2 strands and satin stitch. Use short stitches across the thickness of the letters. If you want to smooth out the edges, outline them with back stitch. Use a single strand of floss for the stars and streaks of light. Embroider the stars with star stitch or with 5 straight stitches that meet in the center. If you plan to frame the embroidery by stretching it in a hoop or on a stretched canvas, make the lightspeed streaks with long straight stitches. If you aren't stretching your finished embroidery, it's best to use an outlining stitch, such as stem stitch.